The Carmex Factory tour! What a great day. Thank you to the Malin family for providing us with this amazing look at how a business runs and how a product is made and shipped all over the world. Dancing to the organ music in the warehouse! The kids did a great job presenting their biography reports and teaching us new things! So proud of them! Titanic: We will complete our novel this week with a culminating test. Students will bring their vocabulary words home to study in preparation. After this, they will begin writing their Titanic Narrative Biography. Each student has a ticket on the White Star Line indicating who they are (a real person who was a passenger), their age, ticket number, where they were from, and what class they were on. They are using their new background knowledge to create a character in their eyes who experienced the beauty of this luxury steamship. Will they live or die? Were they on board with loved ones? What did they do on the ship those days prior? What were their final moments like? We are looking at many of the different crops that are produced in their state. Over the next week, we will also be doing some math including graphs and creating comparisons to how big their state is in acres. The students had fun doing the Five Region State Sort! We are also off and running with the State Fair research project. This week we will be working on the Timeline piece of the project. We will be talking about the early inhabitants of the state of Wisconsin this week as well. For Daily Geography we’ll be looking at a cultural map of Major League Baseball teams—just in time for opening day! 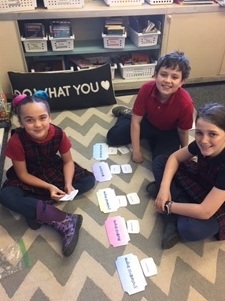 This past week we reviewed the basics of fraction by decomposing whole numbers and fractions. Next we will continue to explore fractions by applying the addition properties to adding fractions. Then we will continue to add mixed numbers and practice simplifying. Our goal is to have a pretest on Friday with a test on Monday. Vocabulary: Chapter 13 Test Friday! Spelling: Lesson 21 VCV (vowel, consonant, vowel) patterns. Writing: Prayers for Lent, Titanic Biography, Narrative writing: My best/worst day! Our virtue this month is RESPECT. We will practice this virtue together and with our 4th grade buddies. We will be attending adoration every Thursday throughout Lent. Finding God-Session 13: The Sacrament of Reconciliation. Describing parables, identifying capital sins pride, sloth, and envy.